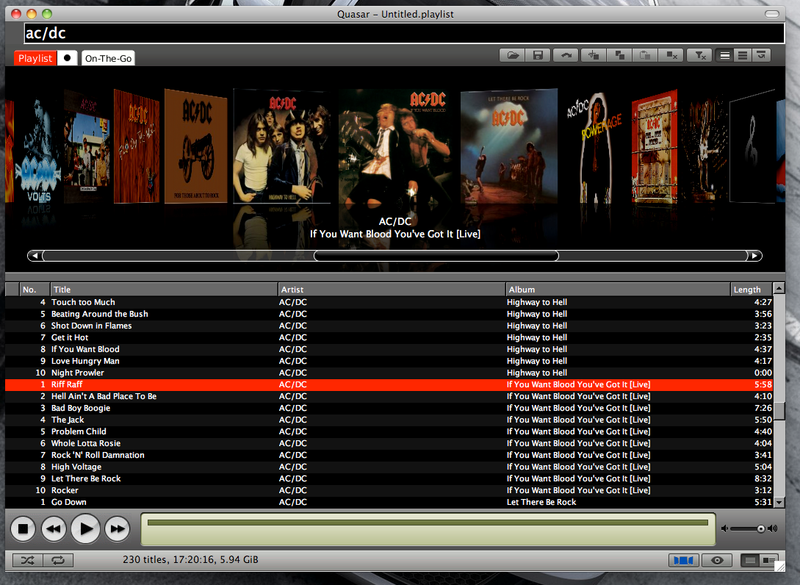 Quasar Media Player is a light-weight, fast and convenient media player optimized for mobile systems. It offers many of the features found in modern desktop media players, like fast library overview and filtering along with the ability to handle large libraries very well. 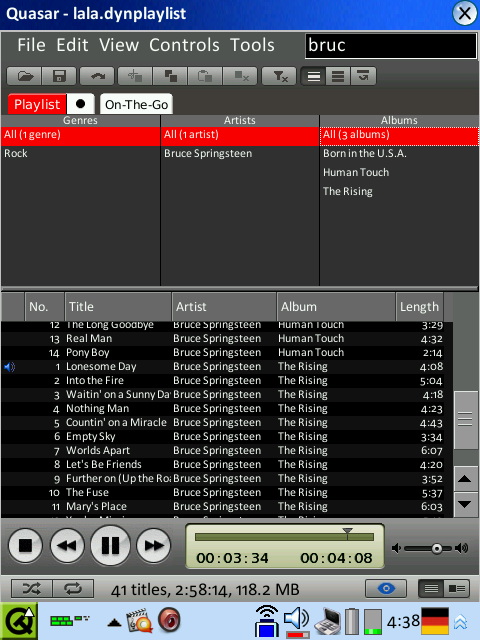 It has several unique features that give it unprecedented flexibility on a mobile device, like a zoom-able interface for better readability even from a distance or auto-generated play lists from a set of locations. It offers flexible support and handling of cover art images and features a cover art album browser and built-in downloader. Quasar is highly configurable and can be operated completely via keyboard, remote control or touchscreen. 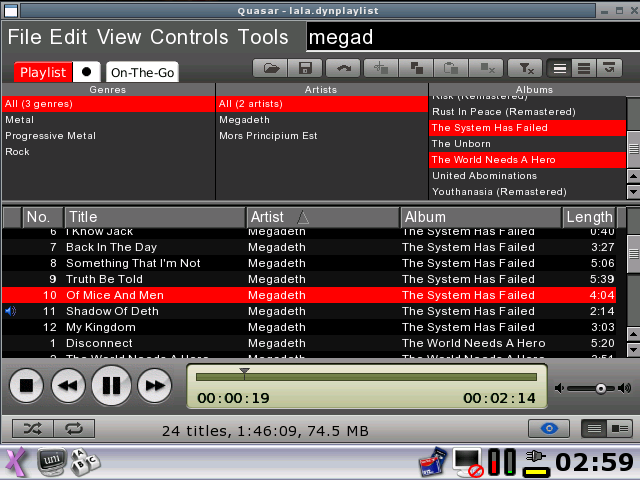 Quasar Media Player initially started as modification of ZPlayer, a MPlayer front-end written in Qt 2 and Qtopia 1.3, but quickly evolved into a fork of the latter project with a completely rewritten foundation and high-performance database back-end. Quasar in its current incarnation still uses some parts of ZPlayer’s code. Thanks to AGAWA Koji (atty) and Atmark for their work on ZPlayer! 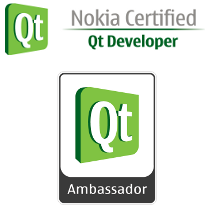 Quasar Media Player is now compilable in Qt 2.x, Qt 3.x and Qt 4.x environments on all major platforms. An unfinished port to Maemo / Nokia N900 is available via the latest SVN snapshots. The user interface is currently being re-written in Qt Quick / QML to better cope with high-DPI small-screen touch devices. I am also looking into supporting MeeGo and Symbian devices. Quasar Media Player supports switching of the media playback back-ends. The current official releases features MPlayer as back-end. The latest nightly builds also support Phonon. Support for GStreamer will be added in a future release. Quasar uses additional libraries like TagLib to add better meta-data parsing. Quasar Media Player is licensed under the terms of the GNU General Public License (GPL) v2 and the source code is freely available. Dynamic playlist: a set of directories and single files that the playlist is created from. Directories can be scanned for files recursively. Dynamic playlists are especially useful if you often add new files to a SD card for instance. You just tell Quasar to rescan instead of having to add those files manually. 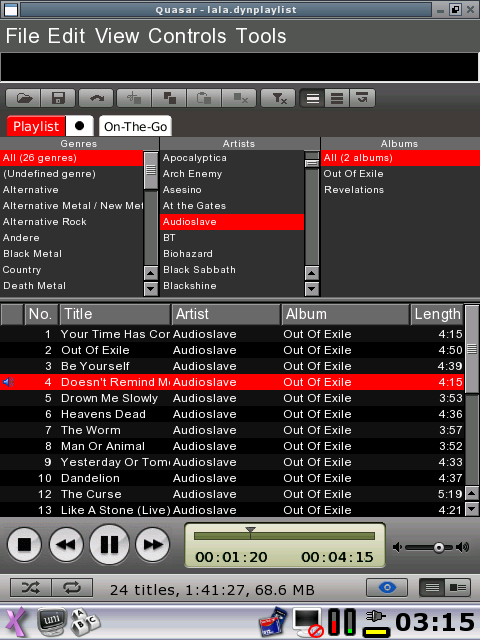 Copy selected files instantly from your main playlist to the On-The-Go playlist via hotkey or button click. Location-agnostic: You can freely move your media files around. Quasar will recognize them without scanning them again. Scans for image files in the same directory as the media file. Recursively scans for an appropriate image file in a separate directory that contains cover art images. For maximum flexibility it will match against directory and file names using straightforward heuristics. New file formats can be added when MPlayer supports them. Support for quickly switching between two predefined skins, e.g. for daylight and night operation in a car environment. Supports adjustment of font sizes in three steps, e.g. for better operability and readability in a car enviroment. Quasar Media Player is licensed under the terms of the GNU General Public License (GPL) v2 and the source code is freely available. In my free-time I have spent many hours developing this program, answering mails and fixing bugs. If you like this program, you can donate any amount you wish using PayPal by clicking the appropriate button below. For a comparison just consider what you would have paid for this application in an AppStore. Your donation will be very much appreciated. It will help to continue support for all platforms and also make sure that future versions stay licensed under the terms of GPL. Please show your support by registering as user on our Ohloh and Freshmeat pages. Thanks! Prior to installing Quasar on your device please make sure you have a working MPlayer installed. After installing Quasar please specify the location of the MPlayer binary in the configuration dialog (Tools > Configuration…). This is necessary on pdaXii13, where the mplayer binary is named “mplayer2”. Quasar will only work with VGA devices, i.e. Sharp Zaurus SL-C7x0 / SL-C860 / SL-C1000 / SL-C3x00 and SL-6000. QVGA devices may be supported in the future – it’s just a matter of adjusting the skin for 320×240. 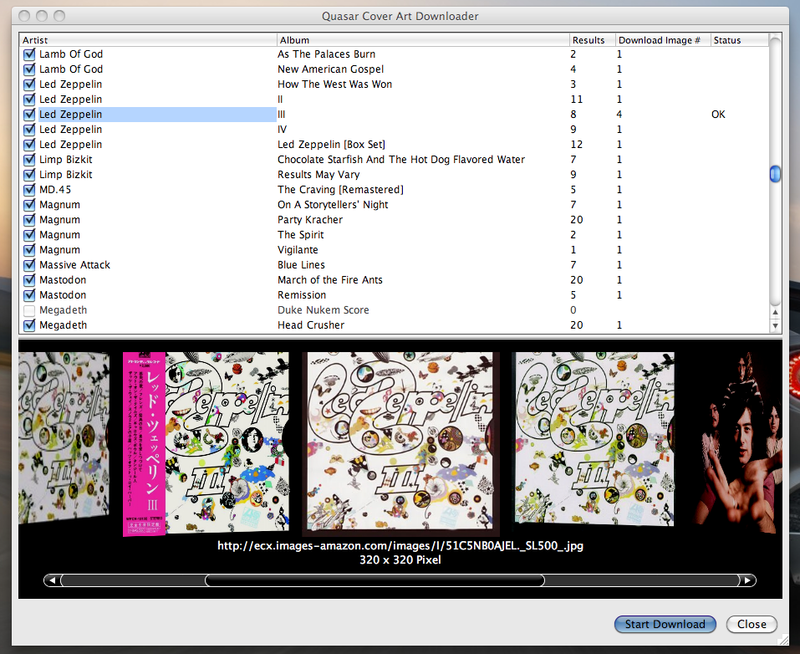 Added support for embedded cover art in MP3 files. If you think you’ve found a bug or if you are missing an important feature and would like to report it, please create a ticket on the development web site. This is the place where I keep track of everything. Please don’t post bug reports into the comments below. Thanks! 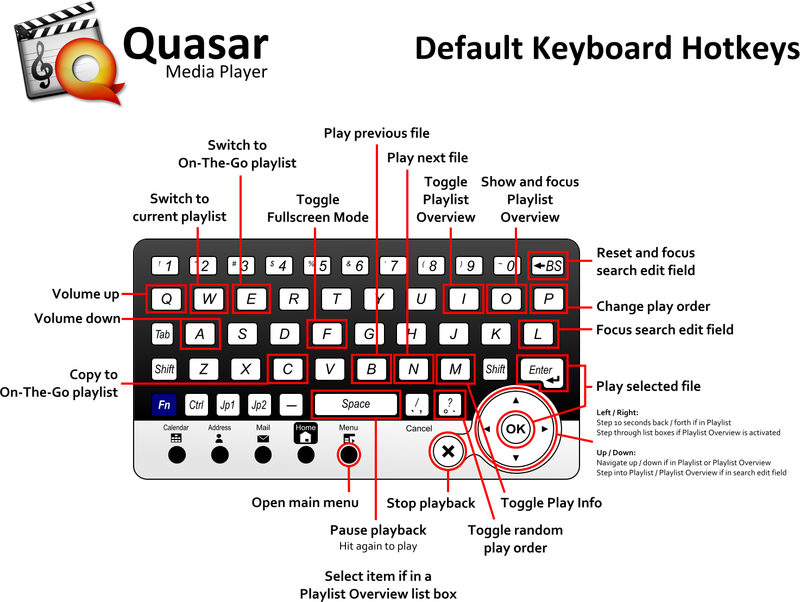 Why do you offer two versions of Quasar Media Player for Windows? One version uses the default way of installing applications on Windows, via an installer application. Quasar is setup to save your settings in your user directory. So this setup works in a multi-user environment. In the other version Quasar Media Player is configured to work as self-contained application. This means, that you can copy the program directory anywhere. All your settings will be saved in that very directory. In this mode directory paths to playlists and media files saved on the same drive will also be made relative. This is a requirement for portable apps on a flash drive, where drive letters may change. How do I install the IPK package? Use you favorite package manager to install the IPK-file for your platform. Please make sure to also install MPlayer as it is required by Quasar Media Player. The volume control doesn’t work on pdaXrom? What gives? This is a known problem related to the way Quasar is controlling the volume by accessing /dev/mixer. The default volume control in the Matchbox taskbar / controlbar completely locks /dev/mixer and thus has exclusive access. In order to control the volume in Quasar (and XMMS too! ), please remove the volume control applet from the bar. will get you the latest development version. The SSL certificate is for secure.customerinterface.de. Don’t worry, it’s my server. If you want to participate in the development, please contact me directly. See here for details. Please do not post bug reports into the comments. Instead use the project’s Trac web site to create a ticket. That way I can keep track of everything. Thanks a lot! hoho, I did not read the blog carefully before.But I realy think Quasar was a native player which not require other player (MPlayer or VLC). Anyway, Thanks a lot for the work. btw: Did you want write a player use MPlayer or VLC ‘s code ? Tighter integration of MPlayer, yes. But I won’t add custom player code into Quasar any time soon – although I have been thinking about it before. Perhaps for common formats like MP3 and Ogg Vorbis… We’ll see. For everything else MPlayer is sufficient. Is the pdaxrom v0.85 newer than the version you had for testing that was still labelled 0.80? Either way the 0.80 that showed the imbedded album art still works great! No Problems. Dale, sorry for the confusion. I somehow missed to raise the version number in the about dialog to 0.81. 0.85 (Beta 2) is newer than the previous two versions. very good work, the first new high quality app I’ve seen for QT in a LONG time. Make’s the old Cacko “kino2” application seem quite basic. Its really great, much better than the original player. Its a great achievement for the zarus. Hi, is Quasar also running on Angstrom? Now, that I have the player I always wanted to have on my Cacko installation, I would not like to miss it, when trying out Angstrom on my Akita. Quasar is really one of the best applications for the Zaurus! Thanks for the nice work! Also, if you’ve got Qt3 and a working GCC running on Angstrom, you can also compile Quasar yourself, if you’ve got experience with compiling apps. I quickly discovered that kino2 has a limit of 33 files per playlist. When I went looking for why, I found Quasar. It immediately sucked in a 128-file playlist. Keep up the great work! Great work, I’ve been trying to find a media player to put on my old Zaurus so i can give it to my wife, very functional, looks great, and is easy to use. Thanks for releaseing the source :). To our regret, I have not used Zaurus any longer. But, I was really surprised. It says again. Awesome works!!! I love this thing !! It rocks…. seems better than kino2 from the playing I have done. I think I have a couple of things I would like to have it do also though. This is an excellent media player for Zaurus! Thanks for your great work. Firstly I’d like to say that this software is excellent and along with the fixes you’ve made to the audio is the answer to some of the issues I’ve been having with my Zaurus. You should get yourself a Paypal account because I for one would donate. I know it sounds silly but a lot of music I listen to are albums which are designed to be listed to from start to finish so I’d love the ability to randomly select an album from a dynamic playlist. I’d be really grateful if you could make this accessible to qvga zaurus users! @JB and @slewis69au, I’ve added your requests to my Trac. And for everybody else that feels the desire to donate something I’ve added a link to the site’s PayPal account above. Would it be easy to make a mac os x binary? Actually I am developing Quasar on OS X using the Qt3 libs of Fink. However, I haven’t updated my Fink installation in quite a while, so perhaps some things have changed. Also I got Quasar running on qt3-mac once, so there is no need to use X11, but that is no longer working. Right now I am finishing features for the next release so I don’t have much time to try anything new. Do you have the Qt4 libs installed? Perhaps it’s colliding with the Qt3 stuff. You can send me the complete log of the compile if you like. That way I can check it out. Just check “About” above for my contact details. Thanks. I was trying with qt3-mac, that’s probably why it didn’t work. I got it compiled today (with qt3, qt3-shlibs, and ccache from fink). As you are working on the next release, would you mind to post a short message on http://www.linuxontour.de/ once you are done with the new version? No binaries available yet and I still have to finish the play info screen and fix some bugs in the Windows port, but all in all it’s already stable. Thank you so much for this. It does everything I want, disables suspend when shut, integrates with volume control applet. Amazing. Have you considered listing this app on elsix? I would like to invite you to write an introduction page for Quasar Media Player. This page will help people easily to find all information of Quasar. And share their ideas with you via wiki page. 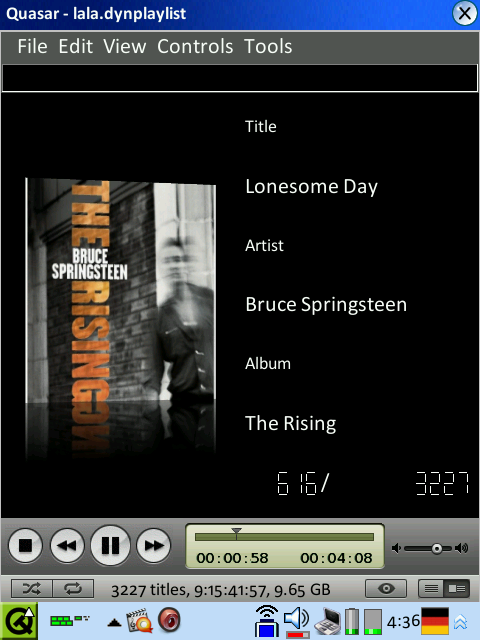 I ported this nice and cool media player for NokiaN810. I had been using it on Zaurus . and now I can use it on N810. Thank you for your good job (I think it is a masterpiece). The Windows and OS X binaries are digitally signed by me. Hi, does your player support QVGA resolutions now? Will you still provide nightly builds for Sharp-ROM or did you stop building for that platform? @elhennig: Don’t worry, I’ll still support the platform and will provide nightly builds for it. Right now, the Debian VM that created most of the nightly builds is on a machine that no longer is up 24/7. I will have to move that VM onto the brand new home server here and things should start rolling again. Also, I started restructuring important parts of the source code to get rid of some nasty problems, so some of the snapshots probably won’t work correctly for some time. I’ll keep you updated. @Pantamorph: No QVGA support yet. However, it should be possible to resize the current skin pretty easily. Just some tinkering in the skin ini file and some GIMP magic. I can’t promise, but perhaps I have something ready for the next release. The new version 0.96 (beta 4) is available now. Enjoy. Is there a way to rotate video display from portrait to landscape? Did anyone succesfully compile quasar onthe sharp netwalker? Hey there! I use Quasar port on Nokia n810 (Maemo Diablo OS) and I wounder where can I find extra skins for Quasar? Superb Music Player… I use a Nokia C7, bt whenever i play a song, most of the album covers do no show up, even if i have downloaded them… Any solution ? How do I refresh music library with Quasar player?